Afghanistan, Pakistan Jointly Call on Taliban to Enter Peace Talks - Integration Through Media ....! 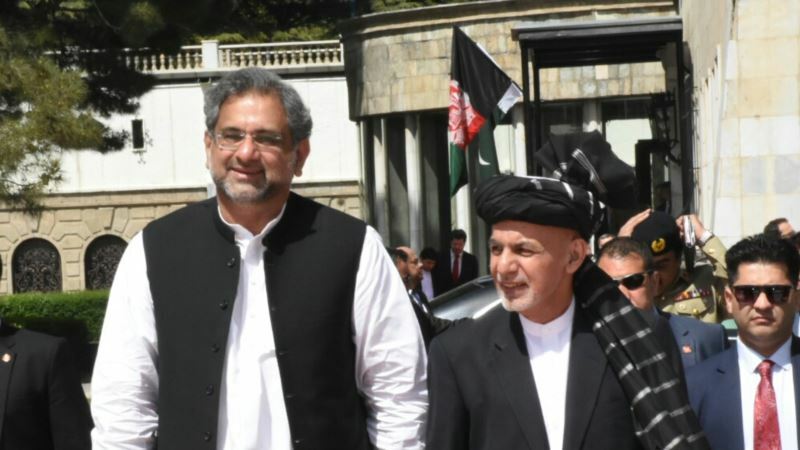 (VOA): Afghanistan and Pakistan have jointly urged the Taliban to accept Kabul’s unconditional offer of peace talks to help find a political solution to the Afghan conflict. The challenge was issued after crucial daylong discussions between President Ashraf Ghani and visiting Pakistani Prime Minister Shahid Khaqan Abbasi, with cabinet ministers and national security advisers of the two countries in attendance. “Both leaders called on the Taliban to respond positively to the peace offer and join the peace process without further delay. They agreed that there was no military solution to the ongoing Afghan conflict and that the political solution was the best way forward,” read a statement Abbasi’s office issued in Islamabad. President Ghani offered unconditional talks to the Taliban more than a month ago in his bid to seek a negotiated settlement to the Afghan war. His initiative received domestic and international backing, but the insurgents have avoided commenting on the overture. There was also no immediate Taliban reaction available to Friday’s joint call for the rebels to join Afghan peace process. Both leaders “agreed on achieving the common aim of regional security through connectivity” — meaning road, rail, trade and transit links as well as importing natural gas and power to Pakistan through Afghanistan from resource-rich Central Asian states. A video released by Pakistani officials showed Abbasi, Ghani and members of their delegations jointly offering Friday prayers at the palace mosque. Later, the Pakistani prime minister held a separate meeting with Afghan Chief Executive Abdullah Abdullah at Abdullah's office. A separate Afghan presidential statement said both sides agreed to further an Islamabad-proposed plan for a comprehensive bilateral dialogue. It said foreign ministries and national security advisers of the two countries have been tasked with jointly finalizing the proposal, known as the Afghanistan-Pakistan Action Plan for Peace and Solidarity or APAPPS. Moreover, rail and road connectivity projects to boost trade and transit activities between and through the two countries also came under discussion. Additionally, the Afghan side raised the issue of alleged cross-border violations by Pakistani forces and urged Prime Minister Abbasi to use official channels if his country has concerns with regard to militant activity originating from the Afghan side. Further, the two nations agreed to form a joint commission to prepare a timetable and mechanism for the dignified repatriation of nearly 3 million Afghan refugees from Pakistan. The crucial visit came a day after the Afghan government said Pakistani fighter jets violated Afghan airspace and bombed areas in the border province of Kunar, although officials reported no damage. Islamabad swiftly rejected the charges as baseless, saying Pakistani security forces were conducting counterterrorism operations inside their own territory to deter Afghanistan-based militants from launching cross-border attacks. A day before traveling to Kabul, Prime Minister Abbasi rejected as “a totally flawed narrative” allegations that Pakistan covertly supports the Taliban to fuel the Afghan conflict. He noted that Pakistani security forces have cleared all their territory of terrorist groups and operations continue to hunt down their remnants. “We don’t accept the narrative that there are any sanctuaries in Pakistan, which result in instability in Afghanistan. That is not the truth. Today, unfortunately, the reverse is true. The people instigating terror in Pakistan are based in Afghanistan,” said Abbasi . Officials in Pakistan said fugitive anti-state militants have taken shelter in “ungoverned” Afghan border areas and plot cross-border attacks from there. U.S. and Afghan officials have long alleged sanctuaries on Pakistani soil have enabled the Taliban to sustain and expand its violent campaign on the Afghan side. Washington has welcomed Islamabad's renewed diplomatic re-engagement with Kabul, saying an improved mutual relationship is essential in regional efforts against terrorism. “Obviously, for there to be stability in Afghanistan, there needs to be a strong relationship between Afghanistan and Pakistan,” said Alice Wells, U.S. principal deputy assistant secretary of state for South and Central Asia, as she wrapped up a weeklong visit to Islamabad on Monday. U.S. President Donald Trump in January suspended military aid to Islamabad until it takes decisive action against the militant havens. This story was written by VOA's Ayaz Gul in Islamabad.